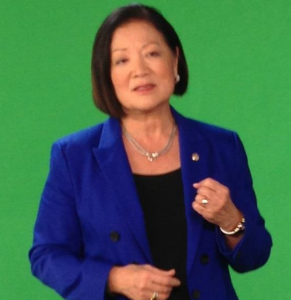 WASHINGTON — Sen. Mazie K. Hirono (D-Hawaii), the first Japanese immigrant to serve in the Senate, has been named Senate co-chair of the Congressional Study Group on Japan (CSGJ), a bipartisan organization committed to promoting dialogue between American lawmakers and their counterparts in Japan. Hirono joins Sen. Lisa Murkowski (R-Alaska) as Senate co-chairs for the CSGJ in its 20th anniversary year. Reps. Shelley Moore Capito (R-W.Va.) and Jim McDermott (D-Wash.) co-chair the group in the House of Representatives. A lawyer by trade, Hirono served in the Hawaii House of Representatives from 1981-1994 and as lieutenant governor from 1994-2002. She was elected to the U.S. House of Representatives in 2006 and served until 2012, when she was elected the state’s junior senator. She now sits on the Senate committees on Armed Services, Judiciary, and Veterans’ Affairs. For 30 years, the Congressional Study Groups have provided substantive, issue-based opportunities for members of Congress to engage with their counterparts abroad. They are the flagship international programs of the U.S. Association of Former Members of Congress (FMC), a bipartisan organization that works to promote public service, strengthen representative democracy, and keep both current and former members of Congress educated, engaged, and empowered to serve their country. Programming of the Congressional Study Group on Japan is supported by grants from the Sasakawa Peace Foundation, the Japan-U.S. Friendship Commission, and the corporations that make up the study group’s Business Advisory Council.